The <style> tag is holds style information for a HTML document or part of a document. In HTML, each document can contain multiple <style> tags. The <style> tag supports Global Attributes and Event Attributes. <style> element belongs to Metadata content, and if the scoped attribute is present flow content. HTML 4 is does not support “scoped” attributes of <style> tag. HTML 5 is support “scoped” attribute of <style> tag. <style> tag is used to set color for a <h1> tag and set the font-size and color for a <p> tag. 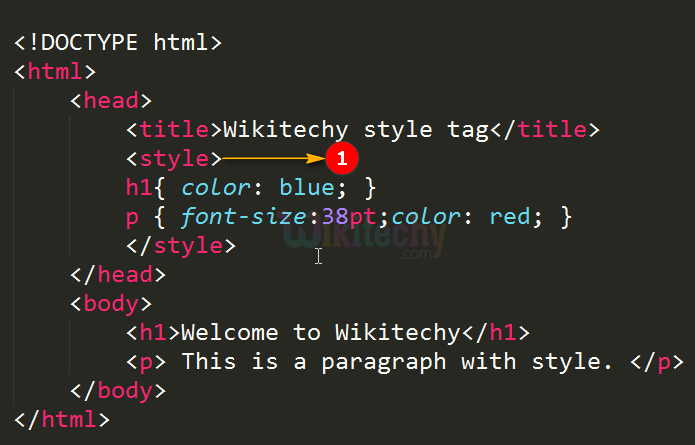 The <h1> tag “Welcome to Wikitechy” content will be displayed in blue color, which is specified in <style> tag. The <p> tag “This is a paragraph with style.” content will be displayed in red color and font-size as 38pt, which is specified in <style> tag. media media_query Yes Yes The attribute define which media the CSS style should apply to. scoped scoped No Yes This attribute is used to define the style only to this element’s parent element and that element’s child element. type text/css Yes No This attribute is used to define the media type of the <style> tag. Use the <link> tag to link an external style sheet. Each <style> tag must be located in the head section, if the “scoped” attribute is not used.